These are a few of the products from my latest project idea. Folk wine. I read up on it a while ago, and decided that it sounded like something worth trying. 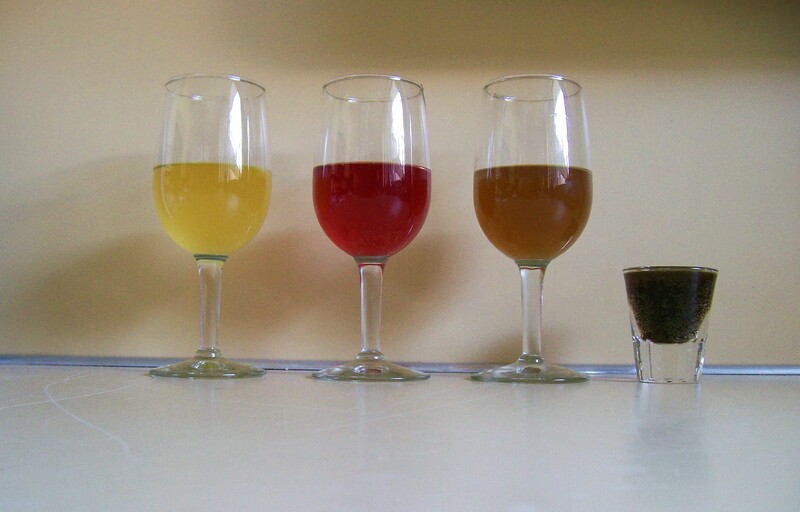 The “white” wine is actually an herbal wine made with a dry chamomile flower infusion and blackberry honey. It is a dessert wine, with a slight bitterness. I don’t actually have a hydrometer yet, so I’m not sure about the ABV percentage. The “red” wine is an apple-raspberry combination where I used organic unfiltered apple juice and added raspberries into the fermentation tank. In my opinion, it is perfect. I think I prefer it over some Zinfadels because it seems like it has a more refreshing fruitiness to it than do grapes. The “green” wine is a super sweet herbal wine made with whole fresh dandelion heads and chammomile blossoms. The sugar is raw demerara cane sugar. I think that I will use a lot less sugar next time and see how it tastes dry. The last mysterious concoction is “Licorice wort”, and I came up with the entire recipe myself. I used various herbs (about 6 or 7), 4 of which resemble the flavor of candy licorice, and then I used molasses for the sugar fermenter. It is really sweet as well– it tastes like drinking candy, but it also has a good kick to it, and both of those reasons are why I chose to put it in a shot glass instead. Over all, I think it is a great project to keep me going for the summer. This week I batched some more wines because of how amazing these turned out. I just need to balance my sugar levels better. This entry was posted in Folk Wine, Food and Drink, Home Brewing, Science and tagged apple, booze, chamomile, dandelion, folk wine, grape, herbal wine, hibiscus, home brewing, medieval drink, raspberry, sake, summer, wine, wort. Bookmark the permalink.